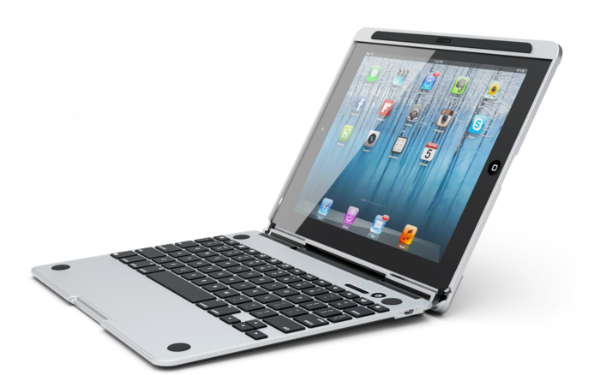 Cruxcase has debuted a new keyboard case that turns your iPad into a laptop. For $155, the Cruxskunk has a full-sized QWERTY keyboard with raised keys, Bluetooth connectivity to hook up to your iPad and a patent-pending hinge that allows for 360 degrees of rotation, according to the company’s Kickstarter page. It is compatible with the newest iPad and the iPad 2. Put together, the keyboard case and iPad combination is 19 mm tall — slightly more than a Macbook Air at 17 mm. The Cruxskunk alone is 6 mm tall. The three main parts of the case are made from “a single piece of aircraft grade aluminum in the exact same process that Apple machines its Macbooks and iPads,” the creators say. They claim that those who have seen the Cruxskunk have mistaken it for a Macbook Pro. Cruxcase, which creates products that integrate with Apple devices, has made similar cases over the last two years. Last year, it launched Crux Loaded for the iPad 2. As of Monday, the company has raised more than $135,000 with 30 days remaining in its Kickstarter campaign. It surpassed its original goal of $90,000 last week. Those who pledge will receive a leather sleeve for carrying the Cruxskunk and a USB cord for charging its battery. Cruxskunk says it plans to produce its first samples in mid-October, and begin full production in late October. The parts will be manufactured and assembled in China. The company adds that it hopes to start shipping in December. Would you buy the keyboard case? Tell us in the comments below.